Dr. Diana Gorokhovsky, D.O. is a clinician whose comprehensive knowledge of medical care includes specialization in family medicine and osteopathy. 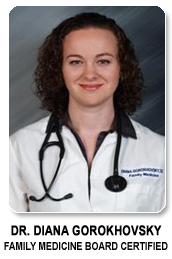 Dr. Gorokhovsky treats many common problems and emergencies, including acute and chronic illnesses. She provides preventive services, health maintenance exams, and health education. She also supervises and coordinates healthcare and arranges appropriate referrals for specialty care. Her medical office has state of the art medical equipment and on-site laboratory. Her staff understands importance of emergencies and offers same day appointment for patients.